This protocol describes the analysis of blinking surface-enhanced Raman scattering due to the random walk of a single molecule on a silver surface using power laws. Kitahama, Y. Observation and Analysis of Blinking Surface-enhanced Raman Scattering. J. Vis. Exp. (131), e56729, doi:10.3791/56729 (2018). From a single molecule at a silver nanoaggregate junction, blinking surface-enhanced Raman scattering (SERS) is observed. 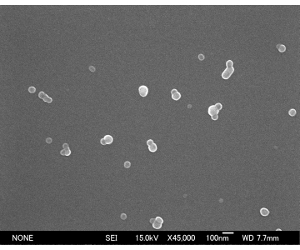 Here, a protocol is presented on how to prepare the SERS-active silver nanoaggregate, record a video of certain blinking spots in the microscopic image, and analyze the blinking statistics. In this analysis, a power law reproduces the probability distributions for bright events relative to their duration. The probability distributions for dark events are fitted by a power law with an exponential function. The parameters of the power law represent molecular behavior in both bright and dark states. The random walk model and the speed of the molecule across the entire silver surface can be estimated. It is difficult to estimate even when using averages, autocorrelation functions, and super-resolution SERS imaging. In the future, power law analyses should be combined with spectral imaging, because the origins of blinking cannot be confirmed by this analysis method alone. 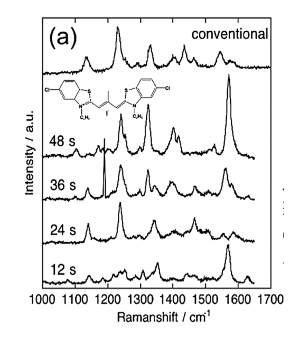 Surface-enhanced Raman scattering (SERS) is highly sensitive Raman spectroscopy from a noble metal surface. Since the Raman spectrum provides detailed information about molecular structure based on the sharp peak positions, through the vibrational modes of functional groups in the molecules, the information of a single molecule on a metal surface can be investigated using SERS1,2,3. From a silver nanoaggregate with an adsorbate at the single-molecule level, a blinking signal is observed1,2,3,4,5,6,7,8,9,10,11,12,13,14,15,16, and the spectrum fluctuates1,2,3,4,5,6,7,8,9,10,11,12,13,14. Blinking can be induced by a single molecule that randomly moves in and out of an enhanced electromagnetic (EM) field at a nanometer-sized silver nanoaggregate junction. Therefore, blinking is considered simple evidence for single-molecule detection, compared with a technique using a Poisson distribution of SERS intensities and a bi-analyte2,3,17. However, the detailed mechanisms of the blinking and fluctuating spectrum, which may strongly depend on molecular behavior on the Ag surface, are still controversial. In previous studies, blinking SERS has been analyzed using the autocorrelation function, which can calculate the diffusion coefficient and concentration of molecules moving in and out of an enhanced EM field12,13,14. Moreover, a normalized standard deviation score, which represents instability in the total intensity, has been derived from the time profile of the signal15. However, these analytic approaches may be based on the behavior of a few molecules. In contrast, in a super-resolution imaging of blinking SERS, single-molecule behavior in an enhanced EM field can be identified16. However, these techniques can obtain such parameters only in an enhanced EM field. The random behavior of a single molecule within a wide range (for instance, in blinking SERS) can be represented as a power law rather than an average4,5,6,7,8,9,10,11, similar to blinking fluorescence from a single semiconductor quantum dot (QD)18,19. By using a power law analysis4,5,6,7,8,9,10,11, molecular behavior can be estimated in both the bright state (in the enhanced EM field) and dark state10; that is, the behavior of the molecule over the entire silver surface can be estimated. For this technique, silver colloidal nanoaggregates are used4,5,6,7,8,9,10,11. These nanoaggregates show various localized surface plasmon resonance (LSPR) bands that strongly affect enhanced electromagnetic fields when they are excited at certain wavelengths. Thus, SERS-active silver nanoparticles exist in colloidal suspension, and some data can immediately be obtained. In the case of simple nanostructures, which have specific sizes, shapes, and arrangements, the LSPR dependence of SERS blinking can conceal other dependences7; namely, if the good or bad nanostructure to LSPR is used, the parameters will be constant, and the other dependences will therefore be hidden. Power law analysis has been used to discover various dependences of the blinking SERS from silver colloidal nanoaggregates4,5,6,7,8,9,10,11. To fabricate silver colloidal nanoparticles, dissolve 0.030 g of silver nitrate and 0.030 g of trisodium citrate dihydrate in 150 mL of water in a 200-mL round bottom flask. Combine the flask with a reflux (Dimroth) condenser. Stir the solution in the flask with a magnetic stirrer and stir bar. Then, heat the stirring solution in the flask in an oil bath at 150 °C for 60 min. NOTE: The solution will turn yellow, then milky grey. Cool the suspension at room temperature, and keep the suspension in the flask covered with aluminum foil in a refrigerator. NOTE: The protocol can be paused at this point. Use the colloidal nanoparticles, after storing in a refrigerator, within one month. To ready a microscope slide, wash a glass plate with soap by hand and rinse it with water. Add 0.1% poly-L-lysine aqueous solution to the glass plate, and remove the solution with a blower. Add the silver colloidal suspension to the glass plate, and remove the suspension with a blower. Enclose a drop area on the glass plate with a liquid blocker pen. Drop distilled water on the glass plate, and cover it with another glass plate to create a microscope slide and prevent water from evaporating. Mix the silver colloidal suspension with thiacyanine or thiacarbocyanine dye (25 or 4 µM, respectively) and a NaCl (10 mM) aqueous solution at a volume ratio of 2:1:1. Drop the sample suspension onto the glass plate, and remove the suspension with a blower. Drop an aqueous solution of NaCl (1 M) on the glass plate to immobilize the silver nanoparticles, and cover it with another glass plate to create a microscope slide plate and prevent the solution from evaporating. Place the sample glass plate prepared using protocol 1.2 or 1.3 on the stage of an inverted microscope. Illuminate the sample glass plate using white light through a dark field condenser, and focus on various colored spots (blue, green, yellow, and red) on the glass plate using an objective lens (60X). Illuminate the sample glass plate using an attenuated beam, delivered at an angle of 30° relative to the sample surface, from a diode pumped solid state (DPSS) continuous-wave (cw) laser through an interference filter. To use laser illumination to observe the silver nanoaggregates as monotonous colored spots in a same-colored surrounding, move the laser illumination area to the center of the view, and focus on the spots on the glass plate by adjusting the stage in the z-direction. Insert a long-pass filter after the objective lens, and illuminate the sample glass plate using a DPSS cw-laser beam delivered at an angle of 30° relative to the sample surface through an interference filter. Find the blinking spots as shown in Figure 1 (see also Figure S1 in the supplementary material) by moving the stage in the x- and y-directions. Record video of the blinking spots with the inverted microscope, coupled to a cooled digital charge-coupled device (CCD) camera, which has a time resolution of 61 - 120 ms, for 20 min. In the software that controls the CCD camera, open the video file. To select the blinking spots and dark area, drag areas that separately cover regions with and without spots in the video image. To derive signal intensity time profiles from the blinking spots and dark areas in the video, select Temporal Analysis in Analysis, and click the Calculate in the Temporal Analysis window. Save the data as a text file. Flatten a baseline of the time profile by subtracting the time profile from the dark area and/or fitting with a polynomial function, as shown in Figures 2A and 2B. 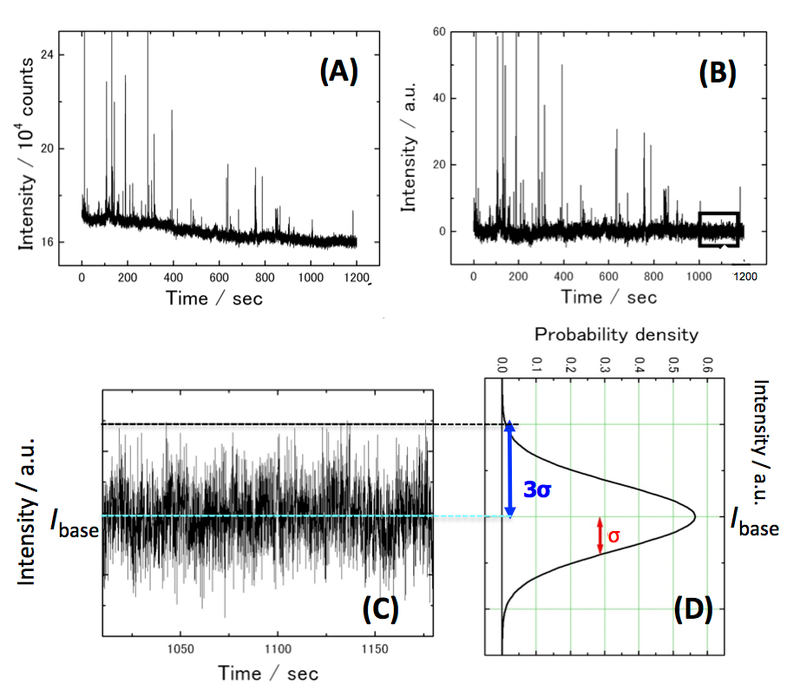 Evaluate an averaged baseline intensity that consists of approximately 2000 points, Ibase, and a standard deviation of baseline intensities, σ, as shown in Figures 2C and 2D. Distinguish bright events from dark events using larger intensities than a threshold of Ibase + 3σ, and record the duration of each event. In Figure 3, for example, record the event from 0 to 3.5476 s as the dark event (with a duration of t = 3.5476 s), and record the event from 3.5476 to 4.0981 s as the bright event (with a duration of t = 0.5505 s). Repeat procedure as shown in Table 1. Count the number of bright and dark events for each duration, as expressed in the first and second lines of Table 2. Sum the number of events for each duration, except for events shorter than duration t. As expressed in the second and third lines of Table 2, for example, sum the number of events for each duration (except for the events for t = 0.0612 s) as 41 + 18 + 9 + …; the result equals the summation for t = 0.1223 s, i.e. 103. Divide the summations by each duration, and normalize them. As expressed in Table 2, for example, divide the summation for duration t = 0.0612 s by the duration 0.0612 s. The result is 3,351.5791. Then, divide the result by the total of the results in the fourth line in Table 2. The probability distribution is derived to be 0.64494. Plot the probability distributions for the bright events Pon(t) against their duration t in a logarithm-logarithm graph, and fit Log10Pon(t) by Log10( ) to deduce the power law exponent αon for a specific blinking spot. If Pon(t) is fitted by , the fitted line deviates from the plots at small values of Pon(t), as shown by the dotted line in Figure 4A. Plot the probability distributions for dark events Poff(t) against their duration t in a logarithm-logarithm graph, and fit Log10Poff(t) by Log10( to deduce the power law exponent αoff and the truncation time τ from the same blinking spot. If Poff(t) is fitted by , the fitted curve deviates from the plots at small values of Poff(t). Repeat 3.2.1 to 3.2.8 for the other blinking spots in the video. From the silver nanoaggregates with poly-L-lysine prepared by protocol 1.2, multicolored blinking spots from SERS and surface-enhanced fluorescence are observed, as shown in Figure 111. 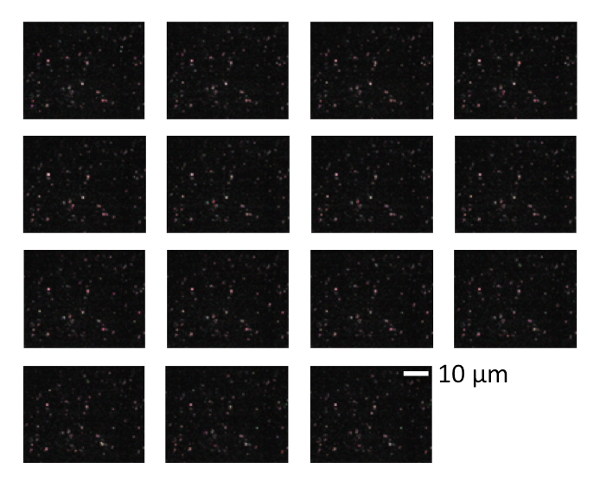 In contrast, monotonous colored blinking spots from SERS were observed for the silver nanoaggregates with the dye molecules prepared by protocol 1.37,8,9,10. There are two types of "negative" results: continuous results, or results where no SERS is observed. The former and latter results may be caused by high or low concentrations of molecules on the colloidal silver surface, respectively. The signals from a single silver nanoaggregate show various intensities at various times, as shown in Figure 2B. This is different from the blinking fluorescence of a single QD. Histograms of the fluorescence intensity show two distinct peaks, which represent bright and dark states18. The time profile over a long range is similar to its expansion in a short range, as in Figure 34. This is referred to as 'self-similarity' or 'fractal'; namely, objects' features are considered similar if their length scales are expanded. In a logarithm-logarithm graph, the probability distributions for bright and dark events are plotted against their durations as a line and curve, respectively, as shown in Figure 4 (as opposed to the blinking from a single QD)19. In the graph, the slope of the line corresponds to the power law exponent. In contrast, the shorter truncation time is deduced from the fact that the power law for the dark state is truncated at shorter tails. For the dark SERS event, the probability distributions are occasionally fitted by a power law rather than by an exponential function. That is, very long truncation times with large errors are sometimes derived9,10. However, it is not a "negative" result that a power law with an exponential function cannot reproduce the probability distributions for a dark SERS event. 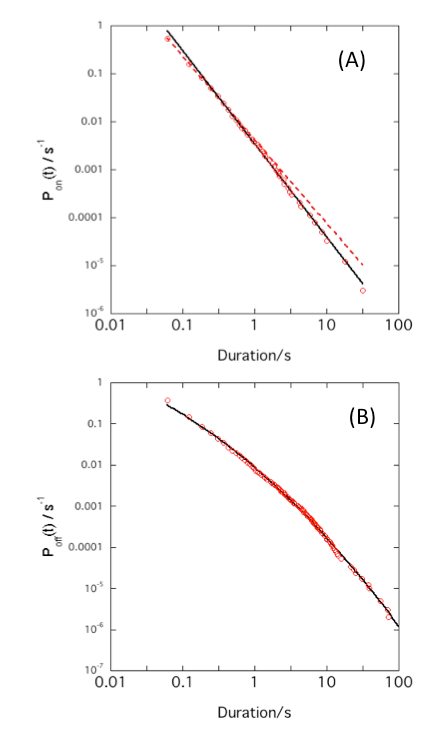 The power law exponents αon/off and truncation times τ deduced from individual silver nanoparticles show various values, as displayed in Figure 5. From the many power law exponents, an average with a standard error is derived and compared to other values in various conditions. In the case of truncation times, the median rather than average may be suitable for comparison. Fortunately, a plethora of data can be gathered from several videos of blinking, because approximately a dozen blinking spots can be simultaneously observed in the video. Figure 1: Representative images of the blinking SERS. 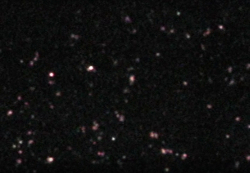 Multicolored blinking spots are observed from silver nanoaggregates with poly-L-lysine. Scale bar = 10 µm. This is taken with an inverted microscope coupled to a color CCD camera through a long pass filter (see the corresponding video movie in Figure S1 of the supplementary material). Please click here to view a larger version of this figure. 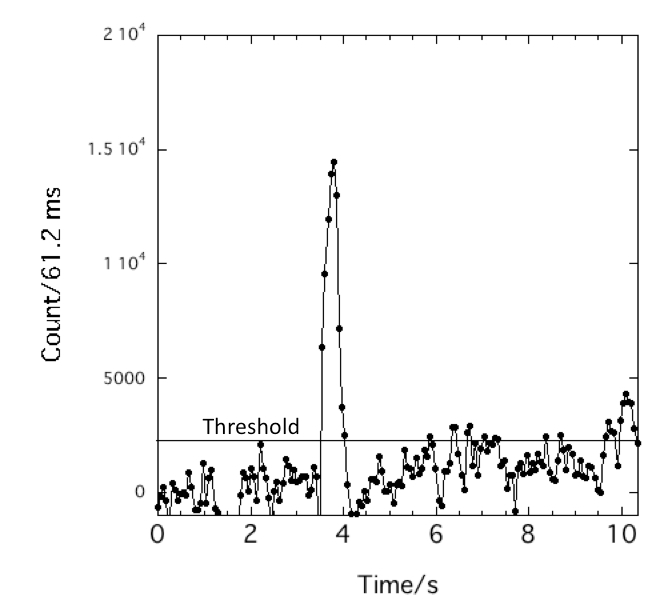 Figure 2: (A) Representative time profile of signal intensity from blinking spot. (B) The time profile whose baseline has been flattened by subtracting the time profile from the dark area and/or fitting via a polynomial function. Reproduced with permission from the Royal Society of Chemistry8. (C) Enlargement of square in (B), namely, the baseline of the time profile. (D) Schematic density of the intensities of baseline points. Please click here to view a larger version of this figure. 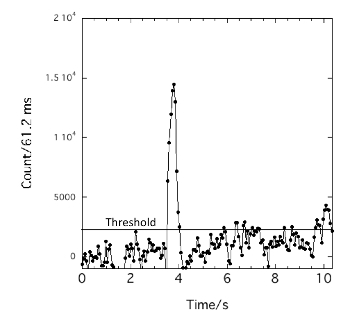 Figure 3: Representative time profile of signal intensity from the blinking spot and threshold for the definition of bright and dark events (horizontal line). Please click here to view a larger version of this figure. Figure 4: Representative probability distributions for blinking spots plotted against their durations. (A) Probability distributions for bright events plotted against their durations in a logarithm-logarithm graph. Solid and dotted lines are fitting results using equations as Log10Pon(t) = Log10( ) and Pon(t) = , respectively. (B) Probability distributions for dark events plotted against their durations in a logarithm-logarithm graph. They can be fitted as a curve given by a power law with an exponential function. Please click here to view a larger version of this figure. Figure 5: Representative histograms of parameters derived from the power law. (A) Histogram of power law exponents for bright events. (B) Histogram of power law exponents for dark events. (C) Histogram of truncation times in power law with an exponential function for the dark events. Please click here to view a larger version of this figure. Figure S2: Representative scanning electron microscope image of silver nanoaggregate formed by addition of poly-L-lysine or NaCl. Please click here to view a larger version of this figure. 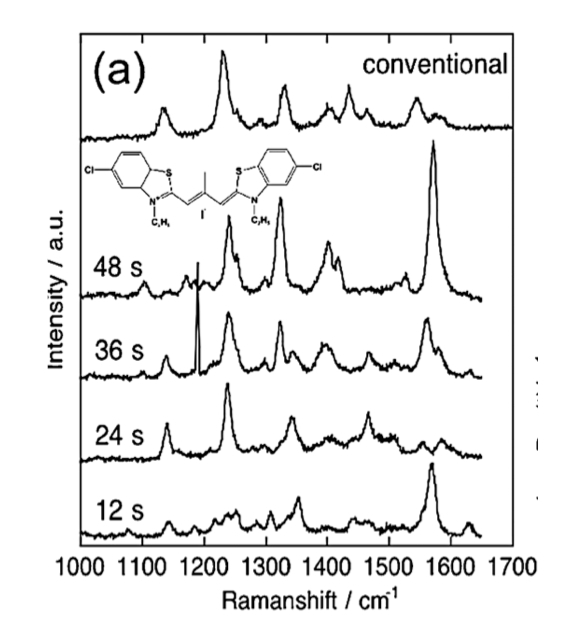 Figure S3: Conventional Raman spectrum for thiacarbocyanine powder, and representative temporal-fluctuated SERS spectra from a single silver nanoaggregate with thiacarbocyanine. Reproduced with permission from the Royal Society of Chemistry8. Please click here to view a larger version of this figure. Table 1: Representative table of dark or bright event, event start time, event end time, and event duration. These were derived from Figure 3. Table 2: Representative table of duration, number of events for each duration, summation of number of events for the longer duration, summations divided by each duration, and their normalized probability distributions. From the silver nanoaggregate junction, SERS is emitted. Thus, we need to prepare nanoaggregates rather than colloidal nanoparticles, which are covered with citrate anions. Silver aggregates are formed from the salting out effect created by the addition of poly-L-lysine, which has -NH3+ and is the origin of the SERS, or Na+ cations from NaCl, as shown in Figure S2 of the supplementary material. Moreover, to illuminate the many spots in the wide area, the unfocused laser beam is delivered at an angle of 30° relative to the sample surface, through a lens that is not attached to the microscope. There is a possibility that the observation area is not illuminated. We adjust and move the laser area to illuminate the observation area with high magnification. After this optimization, monotonous colored spots are visible in the same-colored surroundings. These are critical steps for blinking SERS observation. whose numerator in the middle term (derived from protocol 3.2.5; see the third line of Table 2) tends to decrease at longer durations of t, because even the number of bright and dark events for longer durations tends to be decreased by the fact that the molecules move randomly and can hardly stay in a non-emissive state or emissive state (the junction of the nanoaggregate) for a long period of time, as expressed in the second line of Table 2. The power law exponent α = -1.5 or -1, can be derived from the fact that the molecule randomly walks on the silver surface one- or two-dimensionally, respectively4,5,18. In contrast, the truncation time is shortened by a quicker molecular random walk and/or higher energy barrier from a non-emissive to emissive state4,5,19. It is noted that the percentages of events whose probability distribution cannot be reproduced by a power law with an exponential function are important data9,10, because reproduction failure originates from very long truncation times. In previous studies12,13,14, the autocorrelation function was also used for blinking SERS. The autocorrelation function, which was used for fluorescence correlation spectroscopy, represented the diffusion coefficients and concentrations of fluorescent molecules moving in and out of a focal area21,22. For blinking SERS, however, no simple function can reproduce the autocorrelation function14. This suggests a complex process for blinking SERS, because an autocorrelation function can identify some periodicity. In another quantitative analysis, a normalized standard deviation score was derived from a time profile of the signal15. A large score indicated instability in total intensity. These analysis approaches may be suitable for the behavior of a few molecules, rather than a single molecule's behavior. Moreover, the average durations for bright events were used for the analysis of blinking SERS4,14. These could reveal the behavior of the molecule in an enhanced EM field, similar to the super-resolution imaging of SERS16. 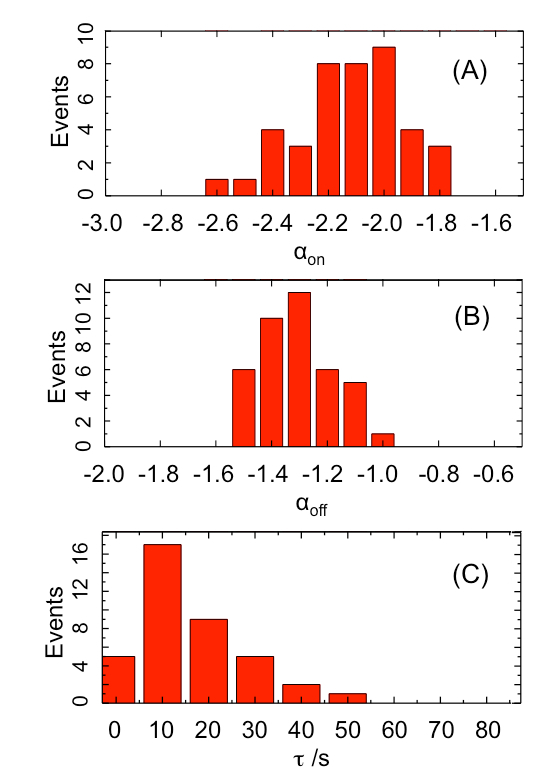 However, the averages for dark events could not be derived; namely, the total durations of dark SERS events from single silver nanoaggregates were decreased by an increase in the number of the events4, while the total duration of bright SERS events increased. Therefore, only the molecular behavior of bright SERS events could be investigated by these techniques. By using a power law analysis, on the other hand, the molecular behavior for the dark state (that is, on the silver surface, except for junctions of silver nanoaggregates) can be estimated in terms of the power law exponent αoff and truncation time10. This is a significant difference from previous techniques. To confirm that the blinking is induced by SERS, the spectrum is measured from the silver nanoaggregate at the center of a view through a pinhole, as shown in Figure S3 in the supplementary material. However, it is not measured from all blinking spots7,8,9,10,11. For poly-L-lysine11, blinking in a long wavelength area is attributed not to SERS, but to surface-enhanced fluorescence, which also originates in enhanced EM fields like SERS. Moreover, it is controversial to connect the fluctuated spectra with the blinking. This is a limitation of the present technique. In the future, blinking SERS should be analyzed in terms of each peak. That is, the power law analysis should be combined with spectral imaging. By using a bi-analyte technique17, in which unique vibrational signatures are observed from mixed analytes, the origin of single-molecule SERS has been confirmed. However, molecular behavior cannot be significantly investigated, because of the time resolution. Recently, the different behavior of each origin has been detected in terms of the truncation times, by observing each of the blinking spots through each optical filter and the power law analysis11. The author thanks Prof. Y. Ozaki (Kwansei Gakuin University) and Dr. T. Itoh (National Institute of Advanced Industrial Science and Technology) for their fruitful discussion of this work. This work was supported by KAKENHI (Grant-in-Aid for Scientific Research C) from the Ministry of Education, Culture, Sports, Science, and Technology (No. 16K05671). Qian, X. M., Nie, S. M. Single-molecule and single-nanoparticle SERS: from fundamental mechanisms to biomedical applications. Chem. Soc. Rev. 37, 912-920 (2008). Pieczonka, N. P. W., Aroca, R. F. Single molecule analysis by surfaced-enhanced Raman scattering. Chem. Soc. Rev. 37, 946-954 (2008). Kneipp, J., Kneipp, H., Kneipp, K. SERS -a single-molecule and nanoscale tool for bioanalytics. Chem. Soc. Rev. 37, 1052-1060 (2008). Kitahama, Y., Ozaki, Y. Analysis of blinking SERS by a power law with an exponential function. Frontiers of Surface-Enhanced Raman Scattering: Single-Nanoparticles and Single Cells. Wiley. Chichester. Chapter 6 (2014). Kitahama, Y. Truncated Power Law Analysis of Blinking SERS. Frontiers of Plasmon Enhanced Spectroscopy Volume 1 (ACS Symposium series Vol. 1245). American Chemical Society. Washington DC. Chapter 4 (2016). Bizzarri, A. R., Cannistraro, S. Lévy Statistics of Vibrational Mode Fluctuations of Single Molecules from Surface-Enhanced Raman Scattering. Phys. Rev. Lett. 94, 068303 (2005). Kitahama, Y., Tanaka, Y., Itoh, T., Ozaki, Y. Power-law analysis of surface-plasmon-enhanced electromagnetic field dependence of blinking SERS of thiacyanine or thiacarbocyanine adsorbed on single silver nanoaggregates. Phys. Chem. Chem. Phys. 13, 7439-7448 (2011). Kitahama, Y., Tanaka, Y., Itoh, T., Ozaki, Y. Analysis of excitation laser intensity dependence of blinking SERRS of thiacarbocyanine adsorbed on single silver nanoaggregates by using a power law with an exponential function. Chem. Commun. 47, 3888-3890 (2011). Kitahama, Y., Enogaki, A., Tanaka, Y., Itoh, T., Ozaki, Y. Truncated power law analysis of blinking SERS of thiacyanine molecules adsorbed on single silver nanoaggregates by excitation at various wavelengths. J. Phys. Chem. C. 117, 9397-9403 (2013). Kitahama, Y., Araki, D., Yamamoto, Y. S., Itoh, T., Ozaki, Y. Different behaviour of molecules in dark SERS state on colloidal Ag nanoparticles estimated by truncated power law analysis of blinking SERS. Phys. Chem. Chem. Phys. 17, 21204-21210 (2015). Kitahama, Y., Nagahiro, T., Tanaka, Y., Itoh, T., Ozaki, Y. Analysis of blinking from multicoloured SERS-active Ag colloidal nanoaggregates with poly-L-lysine via truncated power law. J. Raman. Spectrosc. 48, 570-577 (2017). Habuchi, S., et al. Single-Molecule Surface Enhanced Resonance Raman Spectroscopy of the Enhanced Green Fluorescent Protein. J. Am. Chem. Soc. 125, 8446-8447 (2003). Weiss, A., Haran, G. Time-Dependent Single-Molecule Raman Scattering as a Probe of Surface Dynamics. J. Phys. Chem. B. 105, 12348-12354 (2001). Emory, S. R., Jensen, R. A., Wenda, T., Han, M., Nie, S. Re-examining the origins of spectral blinking in single-molecule and single-nanoparticle SERS. Faraday Discuss. 132, 249-259 (2006). Itoh, T., Iga, M., Tamaru, H., Yoshida, K., Biju, V., Ishikawa, M. Quantitative evaluation of blinking in surface enhanced resonance Raman scattering and fluorescence by electromagnetic mechanism. J. Chem. Phys. 136, 024703 (2012). Willets, K. A. Super-resolution imaging of SERS hot spots. Chem. Soc. Rev. 43, 3854-3864 (2014). Dieringer, J. A., Lettan, R. B., Scheidt, K. A., Van Duyne, R. P. A Frequency Domain Existence Proof of Single-Molecule Surface-Enhanced Raman Spectroscopy. J. Am. Chem. Soc. 129, 16249-16256 (2007). Cichos, F., von Borczyskowski, C., Orrit, M. Power-law intermittency of single emitters. Curr. Opin. Colloid Interface Sci. 12, 272-284 (2007). Tang, J., Marcus, R. A. Mechanisms of fluorescence blinking in semiconductor nanocrystal quantum dots. J. Chem. Phys. 123, 054704 (2005). 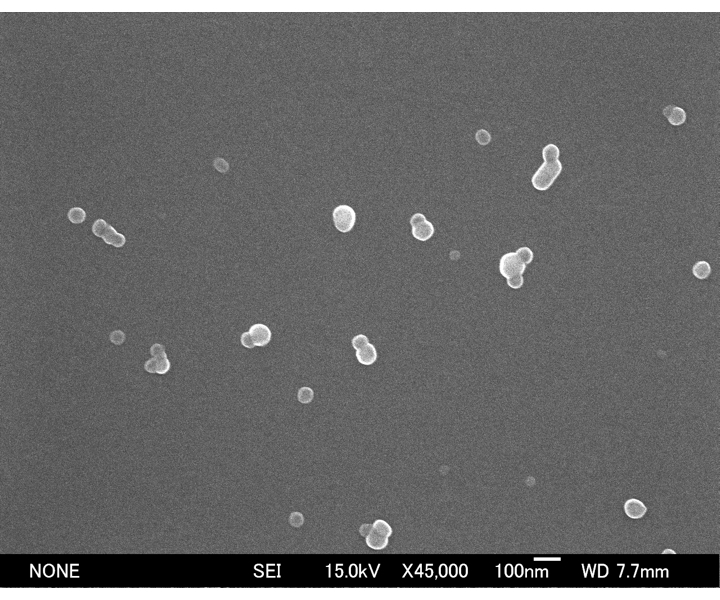 Lee, P. C., Meisel, D. Adsorption and surface-enhanced Raman of dyes on silver and gold sols. J. Phys. Chem. 86, 3391-3395 (1982). Krichevsky, O., Bonnet, G. Fluorescence correlation spectroscopy: the technique and its applications. Rep. Prog. Phys. 65, 251-297 (2002). Hess, S. T., Huang, S., Heikal, A. A., Webb, W. W. Biological and Chemical Applications of Fluorescence Correlation Spectroscopy: A Review. Biochemistry. 41, 697-705 (2002).